The 2.5-liter 16-valve engine appeared in 1988. It replaced the smaller M102 2.3-16v engine, which was the M102 2.3-liter engine mainly with the 16-valve cylinder head. Cosworth designed the 2.5-16v. The engine has the aluminum cylinder head with four valves per cylinder, developed and produced by Cosworth, two overhead camshafts. The 2.5-liter engine got double-row timing chain to fix snapping problem of a single-row chain. The 2.5-16 Evolution I came out in 1989. This version had the same displacement, but the shorter stroke and the bigger bore size. That allowed a higher rev limit and moved more power to high rpm. The Evolution 2 was shown in 1990. It has the same bore and stroke, but higher compression ratio and rev limit. 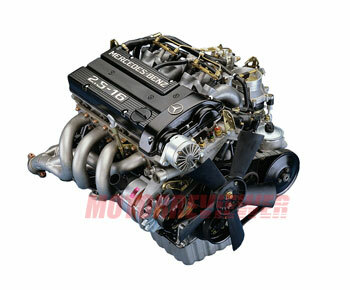 It should be noted that this engine is a high-performance engine and most parts operate on their limit. M102.990 (1988 -1993) - 190E 2.5-16. M102.991 (1989 -1989) - 190 E 2.5-16 Evolution. M102.990 (1990 -1990) - 190 E 2.5-16 Evolution II.